The A’s made a trade this week to shore up a need. They non-tended Ike Davis after a disappointing season, and traded for non-tender candidate Yonder Alonso. While Alonso is reportedly thrilled to be with the Athletics, is he all that different from Ike Davis? What will he provide the A’s that they sorely lack? The A’s have a history of doing this. 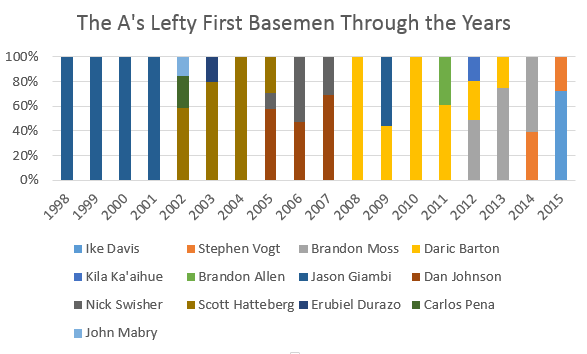 Since 1998, they’ve employed a revolving door of Lefty First Basemen in order to provide some thump at a position where they can hide bad defense. Let’s take a look at who has earned most of that time. I did some queries using the invaluable Baseball Reference Play Index to find all the guys who were left-handed and played First Base for the A’s since ’98. Who was given the most time there in recent years? Disclaimer: For the above chart, I kept the list to 50 games minimum for readability. This era really extends back to 1995, but that’s like, ancient history, man. Giambi was really good during these years. He was the AL MVP in 2000 after leading the league in OBP (.476), OPS+ (187) and Walks (137). He was even better in 2001, where he was basically the same player except 5 less Home Runs and 18 more Doubles. He had even improved his defense to be above-zero at first base with a 0.8 FRAA in 2001. If you’ve got a Jason Giambi under team control, then you don’t need to scrape the garbage heap for replacements. This is the gold standard for the era. Will anything come close to this? We’ve all read Moneyball. We’ve all seen the movie, and know that Hatteberg hit that home run, and then went on to fight Dinosaurs as Star-Lord. While Hatteberg played admirably in 2002, posting a .374 OBP and a 2.6 WARP, he was a huge dropoff from the 9.1 WARP Giambi posted in his last year wearing the Green and Gold. His first year was a bit of a timeshare, splitting time with Carlos Pena and John Mabry, who were also OK. Hatteberg was the best though. He held on to the position through 2004, with the only blip being Erubiel Durazo getting some games in there in 2003. Hatteberg posted a noticeable split in his career, with an OPS 110 points higher against righties. The A’s only took advantage of this in 2002, where he tended to split time with Olmedo Saenz, but he was pressed into a fulltime role in 2003 and 2004, and his performance suffered as a result. Would the A’s realize their mistake and employ a better platoon in the next era? Let’s find out! While Hatteberg stuck around for a little bit in 2005, the next three years were mostly about Swisher and DJ. Both of them were rookies (though Swisher played a little bit in 2004), and played excellently for the 2005 A’s. This is the only era where you see a relatively equal split; this can be attributed to roster construction mostly. Swisher’s ability to play corner outfield well allowed them the flexibility at the lefty first base spot. In 2005 Johnson played mostly, with Swisher in Right, while Hatteberg DH’d for health reasons. In 2006, Frank Thomas showed up, but the A’s also carried switch hitters Bobby Kielty and Milton Bradley, so DJ and Swish tended to bounce around. Keeping Swisher’s bat in the lineup was a priority, as his 35 home runs that year helped the A’s reach the postseason (their last time in the ALCS). Mike Piazza‘s struggles in 2007 allowed Johnson to stay in the lineup, despite being a middling player. Swisher was a star who played all the time. Johnson, on the other hand, had the unfortunate profile of playing the same against both sides (he actually has 12 more points of OPS against lefties than righties), and as such, was due for a replacement. The A’s waived Johnson after 2007, and traded Swisher to the White Sox, clearing way for what they hoped would be the guy who would steady the position for years to come. I’m not sure there’s a more universally reviled name among Oakland A’s fans than Daric Barton. Barton was a top prospect coming to town in the famous Mark Mulder deal. The A’s hoped he would be a stud in the John Olerud mold, as a slick glove who might lead the league in hitting and On-Base Percentage. There was even lingering hope early on that he might be good enough to play third base. His career didn’t begin well. Despite an excellent cup of coffee in 2007, he finished 2008 with a 226/327/348 line, despite being an ever-present presence at first base, as potential platoon partner Mike Sweeney was quite bad. His struggles prompted the A’s to re-sign Giambi to a one-year deal, and he took most of the starts from Barton while surprise star Jack Cust took over at DH. After Giambi left, Barton seemed to finally breakout in 2010, leading the league in walks, hitting ten home runs, and posting what would be a career high .798 OPS. Alas, he completely cratered in 2011, with an OPS under .600, prompting the desperate A’s to give starts to journeyman Brandon Allen. He was somehow even worse against RHP than LHP that year. While he’d stick around the next few seasons as an injury fill-in, his name will forever beget a bad taste in the mouth for the Oakland faithful, as 2008-2011 were not a great time for the Green and Gold. Without a good option in 2012, the A’s went with a combination of Barton and Kila Ka’aihue out of camp. Neither of them played well enough to hold a job, and with an out clause threatening Brandon Moss‘ time in AAA, the A’s opted to roll the dice on him in the bigs. Despite flashes of brilliance, Moss could never play consistently enough with the Red Sox and Pirates to keep a job. He broke out with the A’s in 2012, though, with a .954 OPS and absolutely destroying righties in a platoon with Chris Carter. He held on to the job for the next two years, though his production began to wane. In 2013, he seemed to lose the ability to hit lefties at all, and in 2014 his production against righties began to follow suit. In 2014, after he could only muster a .768 OPS against righties, the A’s opted to trade him to the Indians in order to clear salary space. Though his line against righties wasn’t exactly bad, the A’s seemed to have the idea that Moss’ value was at it’s peak. Another reason for Moss’ departure was that they were able to claim Ike Davis from the Mets. Ike Davis was not only just as good as Moss against righties in 2014 (.765 OPS) but did so in a way (BABIP) that suggested some positive regression in 2015. That wouldn’t happen, though. Davis struggled from the start, and finished with a line bad enough to earn a non-tender from Oakland this offseason. Stephen Vogt, on the other hand, was given the job after recurring injuries hampered his time behind the plate. 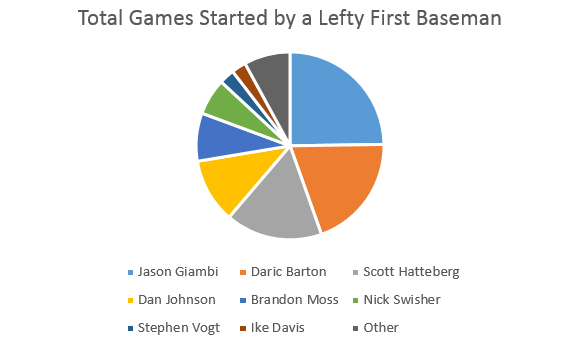 Vogt had a career year, earning an All-Star nod, and happily took over the first base job to keep his bat in the lineup. That bat did seriously struggle in the second half, though, losing .240 points of OPS after that All-Star break. He’s still a part of the A’s plans in 2016, though, but the A’s would prefer to keep him behind the dish in order to keep first base open. 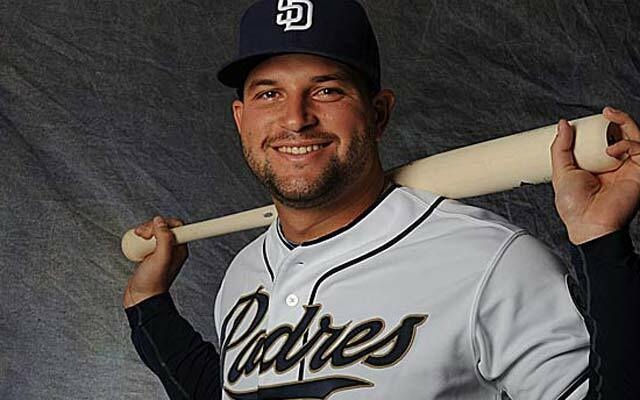 Which brings us to Yonder Alonso. His 2015 was right along with what he’s showed in his career; a decent ability to get hits and take walks, but not much thump behind his bat. He’s definitely a platoon guy, as whatever strength gets him the occasional double is completely absent when facing same-side pitching (.320 SLG/.053 ISO vs LHP in 2015). His walk rate is barely 10 percentage points higher against righties, suggesting he sees the ball much better. Alonso isn’t a world beater, and Daric Barton comps have already been drawn. That said, the A’s still have the aforementioned Stephen Vogt, and his “platoon partner” is Mark Canha who showed a reverse split last year. Don’t think of Alonso as a full-time starter; he very well may end up sitting even against righties, as Vogt and Canha’s bats may force their way into the lineup, especially if all of Coco Crisp, Billy Burns, and Josh Reddick are healthy and producing. So the train rolls on. Alonso is another stopgap measure while the A’s hope to find a real future. If Alonso can produce well, he’ll be a plus batter with some decent on-base ability in a down lineup role. If he doesn’t, well, he didn’t cost much. He’s probably the low man on the totem pole, too, so if there’s a roster crunch at some point in 2016, don’t be surprised to see him waived. After that? The A’s will hope Canha becomes a stud, or probably try the same thing next year. Next post: What If Barry Bonds Was Also Jim Thome?